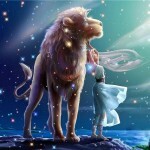 Leo monthly horoscope for the month of January reveals that this month will be an excellent time for Leo professionals. Your contacts will enhance and your performance would be appreciated everywhere. This is also a very good time for those planning to appear for interviews for the stars are in your favor. Stars predict new job offers for you. Do grab them by all means as you will gain immense monetary profits not only now but also in future. The month ahead indicates good flow of income, so you will have a comfortable month regarding income reveals Leo horoscope for January month. However, there are chances that you might lose some money as your expenses will exceed your income during the course of this month. You may also plan to invest on bonds and shares this month. But do investigate before spending on stocks and shares. In addition, stars indicate a favorable time for those planning to purchase a vehicle. On the romantic front, the month indicates enjoyment of romantic pleasure with better support and co-operation from romance partner. If you are already in a stable relationship and trying to convert the same into married life then the first half of the month would be very auspicious time for the same. For single Leos, whole month would be favorable to find a suitable romance partner and make the romantic life blissful says Leo horoscope for January 2015. Health wise, whole month will be a favorable period. However, do not take undue workload as that may provoke your joint pain and nerve related issues in your body. Try maintaining a balance between work and health and you will find that your working stamina and enthusiasm will help you carry out all the tasks in a better manner reveals January month horoscope for Leo natives.